Jordan Rice (inset) was swept to his death when floodwaters surrounded his family's car in Toowoomba. (CNN) -- A teenager who was scared of water drowned in the Queensland floods after begging rescuers to save his younger brother first. 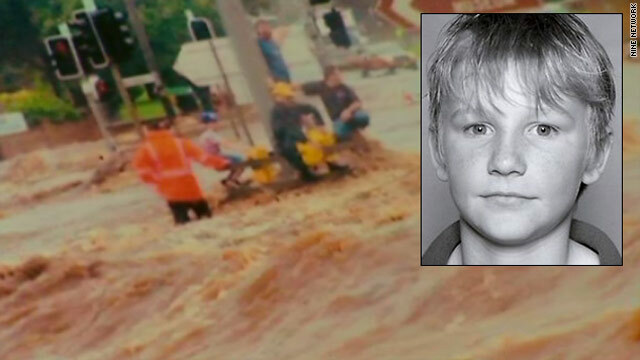 Jordan Rice, 13, and his mother Donna, 43, were swept away as a wall of water hit the town of Toowoomba on Monday afternoon. His family has hailed the youngster's selfless actions. "I can only imagine what was going on inside to give up his life to save his brother, even though he was petrified of water. He is our little hero." Rice was taking Jordan and his 10-year-old brother Blake to buy school uniforms when the family car became stuck in floodwaters. As the tide rose around them, the mother-of-four made a desperate call to the emergency services, and the trio clambered on to the roof of their stranded vehicle, before passer-by Warren McErlean stopped to help. "I called out for some ropes and a guy gave me some ropes and I tied those together and just headed out towards this car," he told the Nine Network. "But the water just kept coming up and by the time I got near this car it just swept me off my feet. "The mum put the boy on his back and brought him across to me and by that time I grabbed the boy and the water kept coming up... it was too much water and there was just no time. The tension took up on the rope and I had to let it go. "He was just pleading with me to please save my mum, please save my mummy - he was screaming to save his mum. "It's terrible. I just kept telling the boy it was going to be alright and it wasn't," a distraught McErlean explained. "I'm just very sorry for himself and his family that we couldn't do some more and get them out." A Facebook page set up as a tribute to Jordan has garnered more than 150,000 supporters, and has been filled with messages of sympathy and support for his father and brothers Blake, Kyle, 16, and Chris, 22. The death toll from the Queensland floods has risen to 15, and there are fears it could grow further as the waters recede in the days to come, with some 70 people still listed as missing. "We still have a number of families who don't know where their children are, who don't know where their loved ones are," said Queensland Premier Anna Bligh. 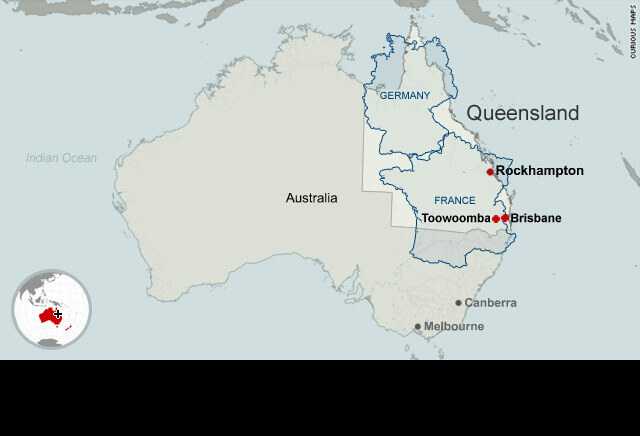 Floods have devastated the landscape of the state of Queensland, Australia, but they also present a high risk to the Great Barrier Reef. Three quarters of the state of Queensland in Australia have been declared a disaster zone after torrential rain threatened the worst flooding in 37 years. More than 500 animals -- including sheep, ducks, goats, a peacock, horses, dogs and cats -- were evacuated from Queensland's largest shelter. The devastating floodwaters are soaking one of the few economic success stories in the developed world since the Great Recession. Brisbane in eastern Australian is reeling from wide-ranging floods that are threatening to exceed the damage done by the record 1974 floods. Brisbane is more accustomed to drought than flood. Residents usually adhere to strict water restrictions during the long wait for rain.